The history of Canada’s national police force is showcased at The Fort — Museum of the North West Mounted Police. The museum tells the story of the history of the North West Mounted Police, from its early days in the 1870s to the world-renowned police force it is today as the Royal Canadian Mounted Police. The history of the force begins with Sir John A. MacDonald, Canada’s first Prime Minister. bringing law, order and Canadian authority to present-day Alberta and Saskatchewan, known at the time as the North West Territories. Nearly 300 officers and men departed Dufferin, Manitoba on July 18, 1874 on what became known as the great “March West.” With horses and equipment in tow they arrived in southern Alberta in October. The troops were able to build a permanent post before winter hit, selecting an island in the Oldman River. This post, named in honour of Col. James Macleod for his strong leadership during the “March West,” served as the headquarters of the entire police force until 1878, and the fort itself remained in use for almost 10 years. uninterrupted views of all sides and pulled the fort out of danger of flooding in the Oldman River. From that post the North West Mounted Police helped stem the North West Rebellion in 1885 and 10 years later had a presence in the Yukon during the Klondike Gold Rush of the late 1890s. The museum, located on westbound Highway 3 near downtown Fort Macleod, stands now to preserve the heritage of the North West Mounted Police. 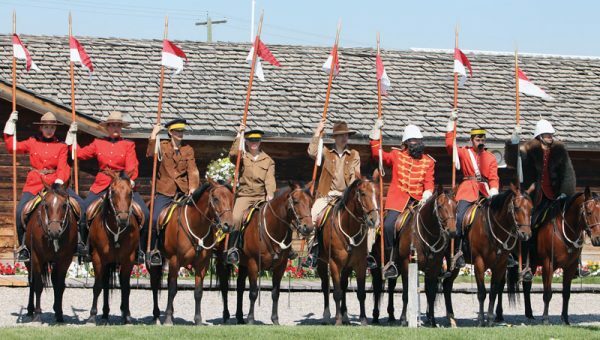 The main focus of The Fort — Museum of the North West Mounted Police is the period between 1874 and 1884.
southern Alberta’s history, from the Mounties to the First Nations people. Displays focusing on uniforms worn by the Mounted Police, tools, weapons and other items they used each day are highlighted at the museum. The orientation gallery holds some of the earliest crests worn by the Mounties, which hold their own story. Other displays in the museum focus on trade and commerce in the early days of Fort Macleod, medicine, ranching, the work of missionaries and transportation. The Blackfoot Gallery, which has been updated and expanded in recent years, tells the history of local First Nations people. The story of Treaty 7 is also told in the gallery. One of the most impressive artifacts is a pair of cuffs worn on the dress of a native woman during the signing of Treaty 7 in 1877. The “Art of Adornment” exhibit explores the artistry of First Nations decorative work to understand it as an expression of spirituality. Head-Smashed-In Buffalo Jump are on display. For more than 40 years the museum has featured a Musical Ride by riders dressed in replica uniforms perform at 10 a.m., 11:30 a.m., 2 p.m. and 3:30 p.m. through July and August. closer relationship with the Mounted Patrol and its Musical Ride through the Red Serge VIP Horse Program. Visitors can purchase a pass to help one of the riders groom their horse for the Musical Ride performance. They will help groom, saddle and bridle the horse, learn the secret of how the maple leaf is put on the horses, and do the inspection of the troop. They will also enjoy VIP ringside seating to watch their horse perform and a special presentation at the end of the ride by their horse and rider team. People can also “adopt” a horse with a donation to a specific horse. Visit www.nwmpmuseum.com for up-to-date details.